Soooooo creepy! 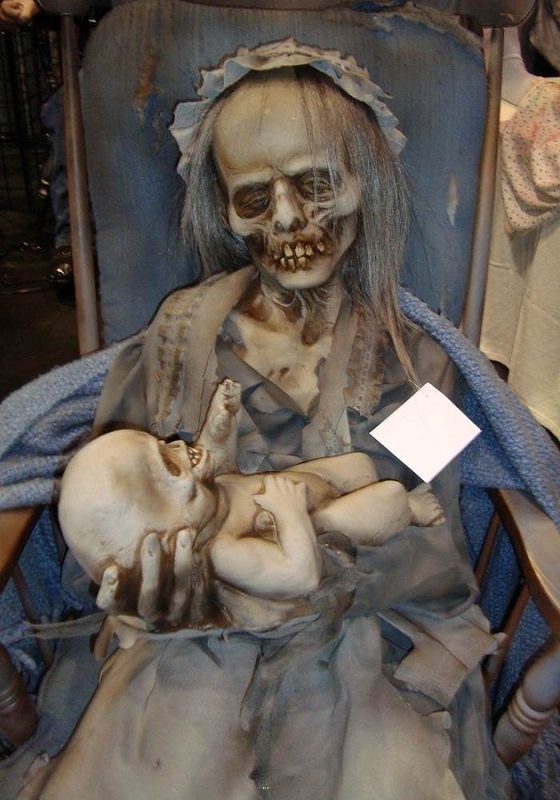 This skeletal old woman rocks her skeletal baby, humming a lullaby the entire time (see video below). Part of the Frightronics line, this heavy duty animated prop will run all day long! Solid steel motor with foam and latex body - this is built to last. Sculpted by Jordu Schell with incredible detail. Soundtrack CD is included. You provide a rocking chair and CD player. All electric and uses regular household current! She runs continuously - not motion or sound activated. Her mechanics are solid steel - nothing plastic. Her body is all latex - her entire torso, head, and full length of legs. A very high quality Halloween prop. 110-240 V.
I had this out for last year and it was a hit. My neighbor's kids wouldn't come near the house after I put her out. 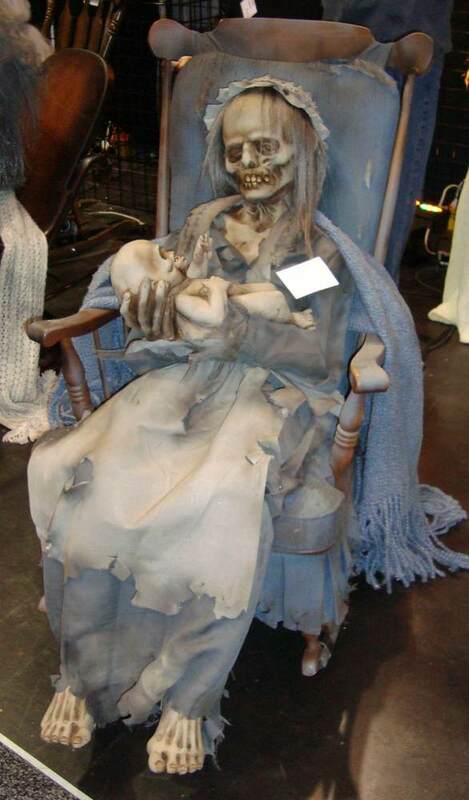 Great addition to any haunted house or just to sit outside on a covered porch just to greet the trick or treaters. I loved this prop. Highly recommend. Really cool, she is made very well, only would have loved the skin color the same as the picture(original prop) but I can do that. Keep making the great props. Works as stated with other reviewers. I would add that you have the obvious sound of a motor running during operation and is difficult to muffle without interfering with the rocking motion. Will get out the WD40 for an annoying SQUEAK with each rotation of the mechanism. Any cheap rocking chair will do. A great prop at a great price. Soundtrack is eerie. So easy to set up and put away. Will be a centerpiece in my hard haunt. She is not as creepy as the pictures make her out to be. She is a solid grey (her whole body and face) which in the pictures they have added makeup. If you are willing to added contrast (makeup) to her she will be so "Soooo Creepy". 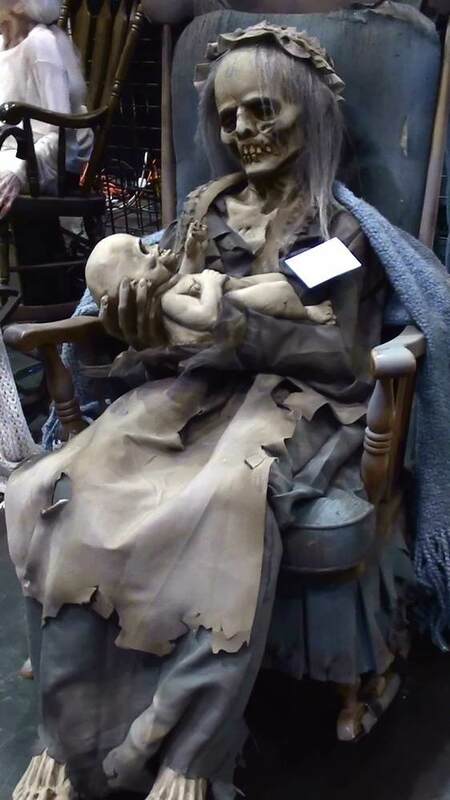 This Lullaby Animated Rocking Prop is AWESONE!!!! It is everything I wxpected it to be and some. She is CREEPY and the CD that comes with her is the most eerie sounding lullabys being hummed I have ever heard. She will make a great addition to our Halloween Party this year. I have a medical skeleton in a real casket. Going to sit her in her chair right next to it! LOVE LOVE LOVE it!!!!! 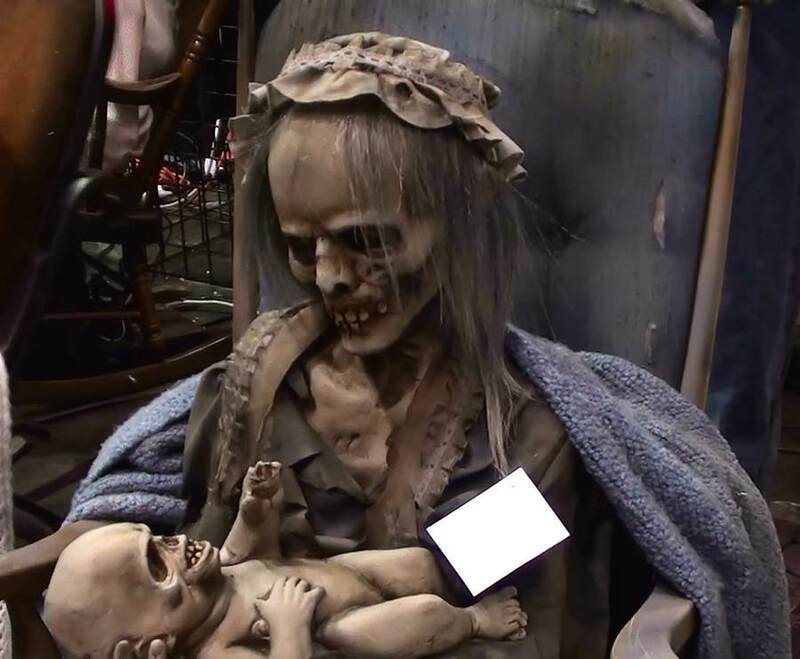 Just received this prop, it was everything described, usually props are smaller than you expect, but this one is huge, really life like, no set up required, just pull her out of the box and set her in a rocking chair. My handyman was at my house when she arrived and he was really impressed as well. You won't be disappointed with her. $300 seemed high, but you get what you pay for, this one is worth it! I guess that's why she never goes on sale - she's a Keeper! Awesome prop. Couple small disappointments. Her left sleeve is not attached to her arm so it looks funny, her hat was not glued on all the way, when she rocks her dress opens in the back. Easily fixed. Absolutely LOVE her! The cd is amazing! Well worth the price!